In the beginning, there were only 5 of us with some supporting actors and recurring cast members, but when the doors were locked and lights went out, it was usually Mom, Dad, Michael, Arthur, and me. 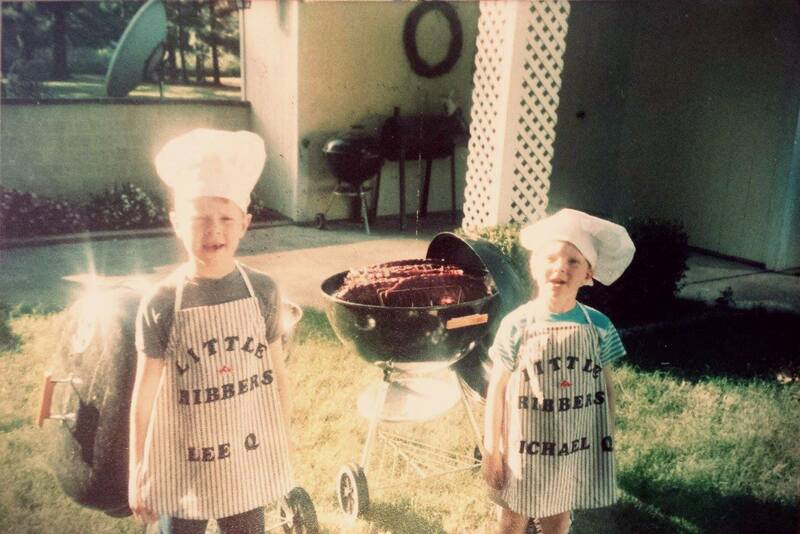 Although Michael and I were children, we had been making BBQ sauce since the late 1980’s. It was a dream of my Dad’s and he chased it through the rough times and the easier times. Nearly each and every batch from the stove top to the mixing tank was handled, mixed, and packaged by Mom, Dad, Michael, Arthur, and me. There were exceptions of course, especially when the Parker family came to put on labels and hang out with Dad, and the times that my best friend Ryan would pull all-nighters on the weekends to fill orders. Bart Crawford, Michael, and Lee with non pictured Matt Crawford - The Sons of the Original Pigtails cooking team. Little did we know that we were building a brand that would outlast the production line it represented. My Dad was a farmer suffering from losses in drought, financial burdens, and physical handicaps, so making sauce went from being a hobby alongside BBQ contests to becoming his only source of income to raise two children along with my mother, Donna, who was working as a kindergarten teacher to survive. After a few years, the sauce business closed up shop and we were left with thousands of mementos in the form of unused labels for jars, business cards, and other marketing collateral of a business left in tattered ruins, but what we hadn’t realized is that the branding and products were seared and branded into the back of everyone’s mind in Wynne, Parkin, and Cherry Valley and we were only to be reminded of that demand every day and every time someone mentioned BBQ so something had to change. After Michael and I moved out of Cherry Valley and into Jonesboro we began hustling non-labeled or retro labeled pints of sauce to have spending money in college. We borrowed our grandmother’s kitchen and pots or simply used our apartment stove whenever we needed to make a small batch. Those days were some of the biggest slaps in the face because we were being told by some of Dad’s best friends and confidants that the sauce wasn’t right and didn’t taste right. We were close, but not quite on the mark until one day Michael found Dad’s Rosetta Stone of a day-planner book and some scribblings of a recipe on the back of a piece of cardboard that fatefully hadn’t been tossed in several years. It was like deciphering Egyptian hieroglyphic runes, but luckily for me, Michael had a degree in Quessenberry Codex that he and my Dad made up to talk in code behind my back to make fun of me. From that point on, we locked in and started to kick around the idea of a new business. Things were good for a while and then like two young brothers sometimes do, we started to aggravate one another and ultimately parted ways. Michael continued to chase the dream and I started to work on other projects while becoming a newly-wed and furthering my career as a website developer. After we cooled off a few years later, we began working together again as brothers and partners to rebuild our legacy. In September of 2014, Michael and I agreed to license the manufacturing and distribution of our products to Bluff City BBQ Supply, LLC, which is the official name of our company now although we’re currently DBA under Jim Quessenberry BBQ. The idea was to establish a 3 year licensing agreement to sell the sauces and spices while building a full BBQ supply store. We agreed to meet with our other partners at Memphis in May to discuss the future of the company and the opportunities that lie ahead of us. In that moment we were introduced to Jeff Marchetta, our partner and would later become our best friend. After it was apparent that our best and only products sold were our own, we decided to dump the BBQ supplier mission and focus only on our products. During this tumultuous phase our now former partner spent resources we didn’t have trying to pry our brand away from our products through fear-mongering, ultimatums, and pseudo-legal action. In the end, he walked away and we grew stronger with Jeff as a huge asset to our company and our marks and brand still in tact. During the end of 2015, it felt like we had 40 plates spinning at once. Although we had all but abandoned the idea of selling hardware, cooking utensils, cookbooks, and other stuff you can readily buy on Amazon.com or at Lowes, we still had a large elephant in the room. Several months prior we had all agreed to try our hand at building smokers. It was a good idea but met with overwhelming odds and a team that was already falling apart from the inside. The idea was to have the Helmets to Hardhats group learn to weld and fabricate while building our smokers so we were helping build American jobs while offering a top of the line smoker at a fraction of the cost of other big name smokers. Unfortunately there’s a huge problem with that. Using training labor like that produces sloppy and inconsistent work at no fault of the fabricators because they’re aspiring and learning their trade, but it also slowed production significantly thus pushing back any efforts or momentum we would have had selling and marketing them. We had also borrowed the money, albeit on a very fair personal loan, to build the 3 initially planned smokers. Due to numerous setbacks and a shortage of common sense when it comes to realizing how much steel actually weighs, we destroyed the axles of several trailers and burned through the build money quickly. It was a wake-up call and one of the ultimate reasons that we have stuck to our own wheelhouse of producing sauces and spices. With a few days to go before repayment, we sold the only prototype smoker to a friend and barely broke even. It was time to make some changes and learn from our mistakes. Shortly after most of the events around the smoker and the alternative facts almost-lawsuit regarding trademark and copyright infringement between Quessenberry Bros vs The Commercial Appeal, we received a letter from an attorney tendering resignation of his client as a partner in the business. After a few laughs and sighs of relief it was time to hit the books and see where we were going into 2016. Going into 2016 was bittersweet. On one end of the spectrum, we’d done really well through the holidays selling gift baskets, but on the other hand we felt like we nearly sold the farm to pay for the cow with the custom smoker build. Fortunately, we didn’t take a huge hit and we went into 2016 with a new sense of spirit and confidence. 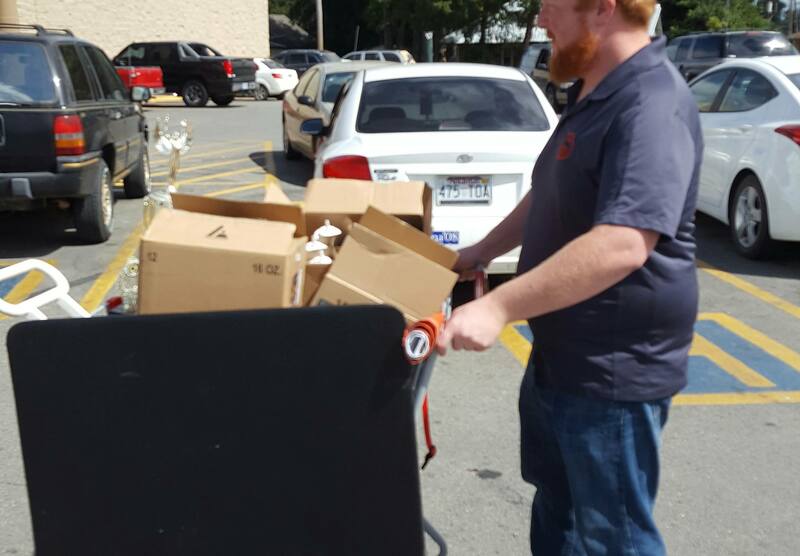 With a lot of the worst of 2015 behind us, we were able to bounce hard in the spring and ramp up sales for summer. *More on the “Alternative Facts” Commercial Appeal almost lawsuit in a separate post to come. Matt, Fabian, Wesley and Patrick – Preparing and filling jars. Lee and Patrick Recreate the Brand Mark of Jim’s Logo Patrick is the World! Lee Spoonfeeds (Airplane Style) a drunken patron at Charlie’s Meat Market in Memphis, TN. Our WORST Label Application. We Were Still Learning. Taking Branding A Little Too Far. During 2016, we were gracious to receive help from our good friend Derek who needed some running money because he was fighting an uphill battle with Veterans Affairs, so we agreed to give him gas money and some commission on sales for every grocery store he could fit jars on a shelf. After three or four months in, we had stores coming to us asking for our product. We still have a don’t ask don’t tell policy with Derek and his persuasive sales techniques, but nonetheless, we’re happy with his contribution. Derek sold sauce until his backpay from Uncle Sam came in so he proudly quit peddling sauce and has taken to hunting, fishing, and helping his Dad who is also a combat veteran. He got us through a tough spot running routes and expanded our volume of wholesale sales singlehandedly. During the late spring, our newest partner joined and has been raising the bar for our retail sales continually since she started. Lynn Black, a very good friend of ours who I initially worked with in the Outer Banks of North Carolina, decided to partner up as a shareholder and take on the task of digital and inbound marketing for retail sales. It has been extremely smooth working with Lynn because no only because she gets the concept of marketing digitally online, but she gets us as teammates. This is something we’d never experienced in prior years. Lynn is a military wife and has built a small empire in the Conch Republic that revolves around digital media marketing and inbound lead capture techniques. When not working on BBQ Sauce with us, she is hustling with me to build local websites and market real estate online. Having lots of time to herself while Ryan is on a boat gives Lynn a unique opportunity to excel as an entrepreneur and as a member of our team. In the midst of all the noise around our former partner and redefining ourselves, the cloud of fog surrounding our new brand, Bluff City BBQ Supply, lifted while revealing what was there in front of us the whole time. 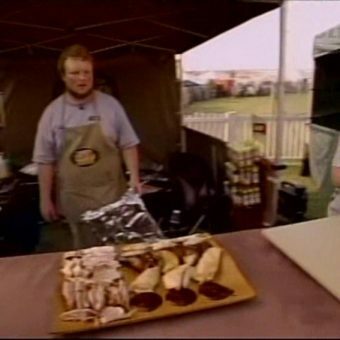 It was Colin Ruthven’s illustration of Jim Quessenberry taking the world championship of BBQ home to the United States from Ireland and it has been the symbol of our brand since the late 1980’s. It was in this moment of realization that we realized something great was in our midst and that we didn’t have to build an entirely new brand, but we needed to rise like a phoenix from the ashes of a once successful brand that my Dad established. In doing so, we had to pay a few thousand dollars in back franchise taxes in the state of Arkansas to clear the Brand of any potential liability no matter how benign or critical it could have been. 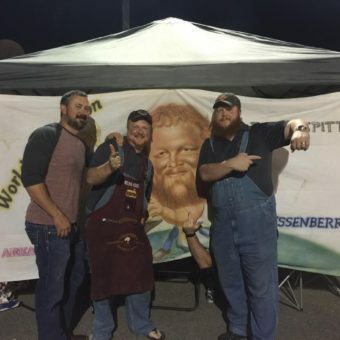 With that monkey off of our backs, we refiled our Articles of Incorporation in Tennessee, added Lynn as a formal shareholder, and amended our operating agreement to remove our former partner as well as adding a DBA of Jim Quessenberry Barbecue to the paperwork. We were back to what we knew best and it was a load of unnecessary effort that had simply vanished for the better. So far in 2017, we’ve enjoyed a period of rest without the hustle and bustle of trying to sell tongs, coolers, aprons, and smokers on our website. Taking the direction of selling our own products and narrowing our efforts to a single operation at a time has been one of our biggest strengths when combined with focused dedication and clear objectives. Once the dust cleared, it was obvious that we had realized our best qualities in each other as a team and we were going to move ahead in 2017 with a boosted confidence in retail sales as well as continued growth via grocers and variety shops. With Lynn’s skills as an inbound marketing specialist combined with Jeff’s skills developing our bottom line expenses, our range of abilities has actually increased the effectiveness of our marketing and sales. Going into December of 2016 we actually outsold some of our prime barbecue season spring and summer months because we were able to shift and adapt as a team to provide gift baskets to one of our favorite local shops, Caldwell Discount Drug Store, in Wynne, Arkansas. We sold nearly 50 baskets to them alone and were just 3 shy of 100 for the entire holiday season. This was proof to us that we can work perfectly as a team without all the distraction and posturing that we’d been accustomed to internally prior to 2016. In the fray of all the account maintenance, production, marketing, and daily tasks, one thing was for certain. Sauce Beautiful is our workhorse. It piles up the yards, is a key player of our major successes, and works well as a lead blocker, or in this case a sales lead enabler, to allow our other products to establish their own successes to put more numbers on the scoreboard. Rather than spend money advertising the unknown, we’re putting our advertising into the known and increasing the height of sales with the original recipe so that we can begin looking for other opportunities of growth. In conclusion, we’ve learned to never settle for sub-par performance, negativity, coercion, manipulation, or deceitful business practices from within or from outside forces. Each move we make is carefully calculated and we take time to do things the most effective way. Our products are carefully crafted to perfection so that everyone gets a taste of our success and our products. We hope that you enjoy our products as much as we like making them for you.